Your gut is exposed daily to food, microbes and chemicals. Although it seems ‘inside,’ your gut is your body’s contact with the outside world! The GI tract works continuously to defend your body from unwanted substances. 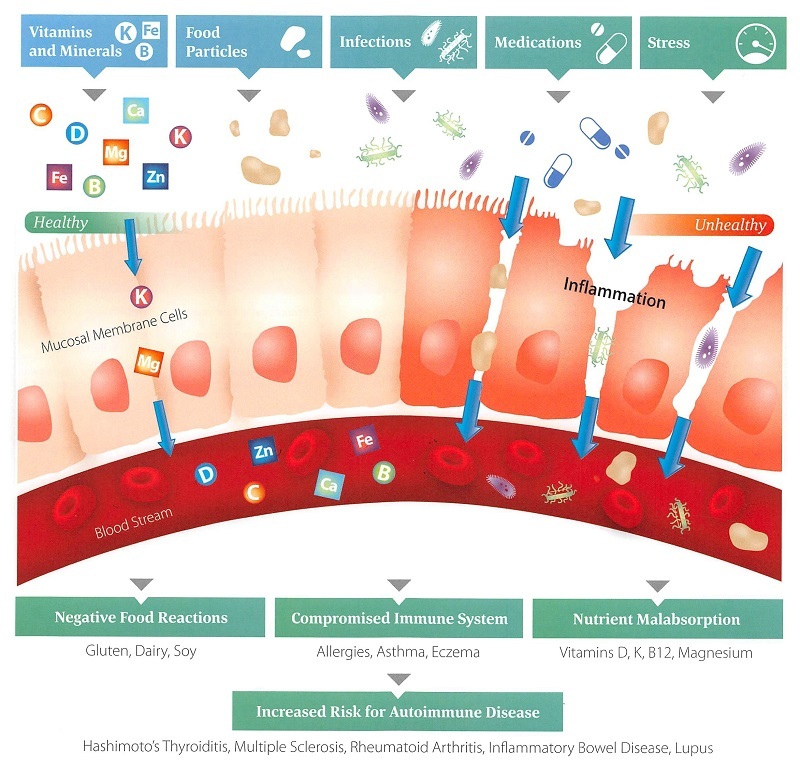 The gastrointestinal (GI) barrier is an intricate and selective barrier that controls and permits the absorption of helpful substances into the bloodstream while keeping out those that are harmful. In healthy people, the barrier is tightly regulated, and allows only important nutrients to pass through the gut. This protects the body from harmful substances such as toxins, undigested food and pathogens. Constant exposure to unhealthy foreign substances can cause the walls of the intestines to become vulnerable to deterioration and permeability, a condition commonly referred to as Leaky Gut Syndrome. If these unwanted substances are allowed entry into the body, the body’s immune system goes into overdrive to attack the foreign invaders. This causes a vicious cycle of inflammation as the body works overtime to clear out unhealthy particles. Overworked immune systems become tired and overwhelmed. This allows toxins, pathogens and chemicals to pass through into the blood stream, where they can accumulate in cells, tissues and organs. Accumulation of these particles, combined with an immune system in continuous overdrive, causes inflammation and other conditions such as Arthritis, Autoimmune Dysfunction, Chronic Pain, Inflammatory Bowl Disease, Lupus, Multiple Sclerosis, Food Sensitivities, and Allergies. Foreign substances traveling in the blood stream may also cross the blood-brain barrier - a condition called Leaky Brain. Functional Medicine research is discovering connections between this cascade and the root causes of neurological conditions such as Parkinson's, MS, Dementia, Alzheimer's, ADHD, Depression, and more. There is Hope and Bright Path Can Help!